This is a quick review of 3 small space heaters: Lasko model 754200, Optimus model H-6003, and the Bionaire BCH9214RE. In my quest for the best small heater, I chose these three portable heaters because after researching small heaters they all looked promising. I ended up buying all three. I am returning one of them. Find out which is the best heater…. I wanted an affordable small portable heater to heat my home office. I also wanted one to heat my dog’s cage (where he sleeps at night in our bedroom), and I wanted a small heater I could easily move room to room as needed to heat a small area of that room. I was not looking to heat entire rooms (except maybe a bathroom). I give this heater 5 stars. 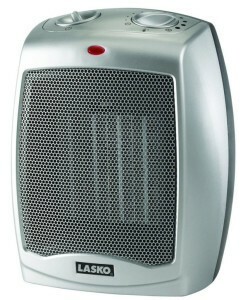 The Lasko 754200 Ceramic Heater is the number 1 selling small portable heater on Amazon and I see why. I bought the small Lasko 754200 heater on Amazon for $25 (free prime shipping). Check current Amazon price here. Very affordable space heater. I was impressed with this little heater out of the box. The quality seemed solid. It has fan only setting (good for summer) and a high & low temp setting on the left and a thermostat setting on the right. The thermostat is not digital, so you have to play with it to get it where you want it to kick in. I leave the heat setting on low (#1) to conserve energy. It is plenty hot for my use. I use the small Lasko 754200 in my home office. I have it sitting about 3-4 feet away from my desk. The fan does a good job of blowing the heat so my entire desk area is warm. My office is about 12’x13′ in size – with high cathedral ceiling. I notice when I come into the room after heater has been on a short while, the entire room seems warm. The fan noise is very quiet… a nice white noise sound which if used in a bedroom would be fine and hardly noticeable. May even help put you to sleep. When it turns on there is no loud noise or clicks like some heaters. Although it has a fan-only mode, don’t expect it to replace a regular fan. It will push out some air but only enough to use as a personal fan at close range. I highly recommend the Lasko 754200 heater for small room and personal heating. It is the best small heater I’ve found so far. I give this heater 4 stars. I bought this heater at Costco for $39.99. It is also available on Amazon (check current price). So far I am very happy with this heater. It is small, comes with a remote control, and osculates (if you want it to). I am currently using the Bionaire to keep my dog, Brody, warm at night. It comes with a digital thermostat so you can set the temperature and the Bionaire Heater will kick on if the temp drops below your setting. The lowest setting is 60 degrees, which I thought may be a problem if you wanted to set it lower. On my unit, the 60 degree setting is more like 55 degrees. It does have a 40 degree setting that you can use to keep pipes from freezing. I live in S. CA so that isn’t a problem for me. I’ve found the thermostat is not that accurate. I set it for 67 degrees in order for it to kick on when our room gets to about 55-60 degrees. The heater is positioned about a foot from the side of Brody’s cage. We have blankets over the cage to contain the heat. Brody is a 110 lb Doberman – large and short hair. His cage is 48″ long, 42″ high. The Bionaire heater only kicks on a few times during the colder nights. The fan blows the warm air into Brody’s cage (he doesn’t seem to mind)… then after a couple minutes it automatically cuts off. 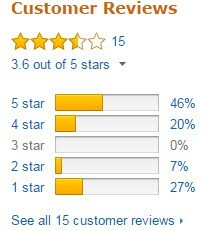 4 stars because the thermostat is not very accurate, and the instructions for the settings is not that clear. I wish manufacturers would put a little more effort into their instruction sheets. It has an Eco setting, but I’m not sure how it works – supposedly, it will adjust wattage used to be most efficient. But I don’t know if I can set the thermostat and use it. If I have Eco selected it blows heat, then if I turn the thermostat wheel it seems to switch to Thermostat mode. I don’t know if I left it on Eco setting if it would continuously run. The Bionaire heater BCH9124 also has a Max Heat setting which I assume keeps the heater on constantly. The fan noise is not bad, a little louder than the Lasko heater. When it kicks on, I can hear it but it doesn’t disrupt my sleep that much. However, I do stay awake until it cuts off, worried my dog may be getting too hot (which he isn’t). Check out the (click here) reviews on Amazon …. Check out (click here) Bionaire BCH9124 on Amazon. I give this heater 1 star. 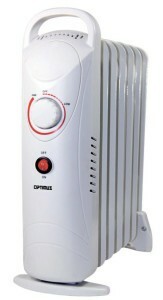 The Optimus H-6003 looks like a mini radiator. Unlike the previous 2 heaters, the Optimus H6003 is filled with oil which heats up and radiates the heat. There is no fan or noise. Sounded perfect for my dog’s cage. I bought this heater at NewEgg.com for $35. I had a $10 promocode, otherwise I would have purchased at Amazon. Amazon’s price was $33 (free Prime shipping) – check current price here. Actually, don’t bother – it is not worth buying. I ran the Optimus H-6003 all night at full setting. My dog’s cage didn’t even feel 1 degree warmer. Unless you are a foot or less from this heater, you will not feel any heat. The Optimus H6003 uses 700 watts of energy. I pay about $.22-$.28 per KWH. I calculated to run this all night was costing me about $.18/hr x 8 hours = $1.44 (or $43/month)… for nothing… no heat. I DO NOT RECOMMEND this heater! I’m returning this to NewEgg.com. When I went online to get an RMA # and return instructions, I found out that 1) I have to pay for shipping it back, and 2) I have to pay a 15% restocking fee. Over the years I have purchased a lot of computer equipment from NewEgg – mostly hard drives. Never had a problem, and never had to return anything. This return opened my eyes. I doubt I will buy anything from NewEgg again, unless I am sure of the product I am buying. They wanted to charge $12.50 return shipping (provide me a label) or I can ship myself – which I will ($8.50). Amazon often (but not always) pays for return shipping and does not charge a restocking fee. Buy Amazon! Of these three heaters, I highly recommend the Lasko 754200. It is the least expensive and does a great job heating smaller areas. It is relatively quiet and very easy to move around – only weighs a few pounds. The cord is fairly long. 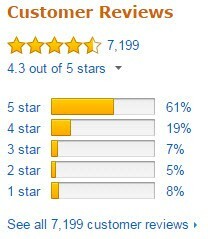 To see more reviews & price on Amazon – Click here. The Bionaire is also pretty good with nice features like the remote and ability to osculate. It is also a nice looking heater. It has a high tech look with the digital readout. It also has more settings than the other 2. It may be slightly better than the Lasko heating a larger room… but not much better. To see more reviews & price on Amazon – Click here. The Optimus H-6003 looks nice but doesn’t produce enough heat to be a contender. Maybe if you get its larger brothers you will have better luck in producing heat. The advantage of oil heaters is no noise or fan. The disadvantage is the heat doesn’t project into the room as well or fast as fan heaters. 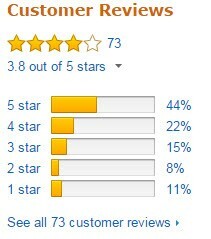 To see more reviews & price on Amazon – Click here. NOTE: I also have an older Lakewood Tall Ceramic heater with 2 ceramic elements. I’ve had it for years. The good is it puts off a lot of heat if you are within several feet of the front of the unit. The bad is it is more intense heat, gets very hot, does not have a very large radius, and when you turn it off, whatever heat was generated, seems to dissipate very quickly. For those reasons, I am not a fan (pun intended) of fanless ceramic radiating heaters. Good for quick direct heat, bad for warming a room.